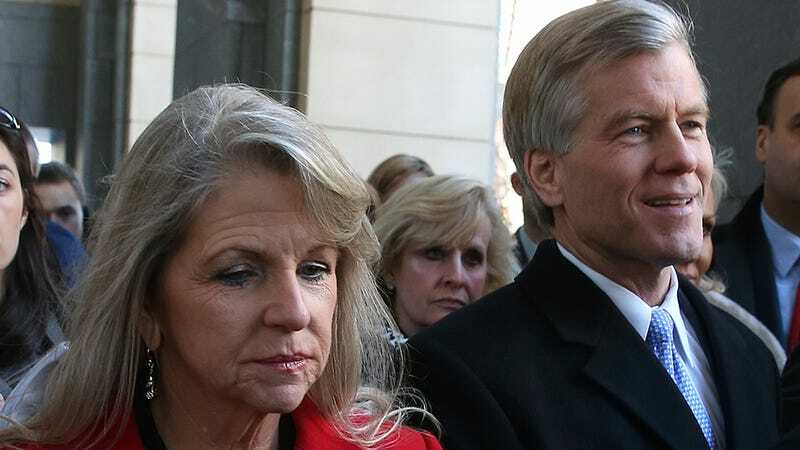 Former Virginia Governor Bob McDonnell and his wife Maureen were found guilty of fraud and corruption earlier today. Both cried. Sentencing will happen in January, but McDonnell's life is already in ruins due to the fact that he sold his office's influence to a vitamin salesman. Among the things that McDonnell and family received for allowing Jonnie Williams, CEO of a supplement enterprise, to gain special favors and advertise his pills on a state level were Rolexes, $20,000 worth of clothes for McDonnell's wife and even a swanky $15,000 wedding reception for their daughter. In all, McDonnell was accused in taking over $170,000 from Williams. McDonnell also got to drive a Ferrari, which is a memory he will hopefully treasure in prison (or wherever you go for "stamping on Virginia's flag by selling out your office"). I have always said that vitamins are bad for you. No, I will not take your Cs, Ds, and Bs. I will not swallow your capsules and your easy-to-digest chewables and now McDonnell won't either, because he knows that vitamins (along with taking bribes and being dishonest and also a bad person) bring ruin and damnation wherever they are seen. Probably the bribe thing was more important, but I have a vendetta against vitamins so I'm going to believe that's what happened here. NBC reports that while the McDonnells tried to fight the charges, no one bought their strategy of attempting to prove innocence by stating that their marriage was so awful that they couldn't have possibly worked together to commit any sort of crime. It does appear, however, that Maureen McDonnell may have have a super-hot crush on Williams (who might have had a crush back because he bought her so many clothes, but could also have just liked her and not like liked her). "The evidence shows that she was gaga for Jonnie," Maureen McDonnell's defense lawyer, William Burck, said, adding that his client genuinely believed in Williams' product. The McDonnells were first accused of wrongdoing when they fired a chef who they claimed had been stealing food from them. Unfortunately for them (and fortunately for Virginia), the chef had documents proving that Williams had paid for the McDonnells' daughter's wedding. Williams received immunity for his testimony and will not be charged. It seems fitting that a governor that became notorious in pro-choice circles for using pseudoscience to justify his pro mandatory transvaginal ultrasound stance would himself be felled by a company that sells pseudoscience.